I was on a strawberry canning kick during the middle of May. Sixteen quarts…and what ya’ got? (Sing to the tune of “Sixteen Tons,” please.) I got a lot of pints of strawberry jam. I hate to make the same old, plain Jane jam, so during my canning frenzy, I made Strawberry-Lemon Marmalade, Strawberry Balsamic and Strawberry Vanilla Jams, and this creation: Balsamic-Basil Strawberry Jam. Remove the pot from the heat and skim off foam if necessary. Stir in the balsamic and basil. Ladle into hot, sterilized canning jars, leaving 1/4 inch of headspace. Wipe rims, place sterilized lids, and screw on bands finger tight. Process in canner for 10 minutes. Make sure boiling water is covering jars by 1 inch. After 10 minutes, carefully remove the jars and let cool for 12 hours. Gourmet Garden’s lightly dried herbs are perfect for canning. Even though I grow my own herbs during the summer months, fresh herbs tend to turn dark and slimy if used for canning. Image from Gourmet Gardens’ website. These lightly dried herbs will not turn dark and they retain more flavor than regular dried herbs that can be found in the spice aisle. I use the basil when canning tomato sauce and I use the cilantro for canning salsa and jalapeno relish. Jam always reminds me of hot summers. Growing up, mom would can away….jams, jellies, preserves. She would also can peaches, pears, and cherries. Using her hissing and scary pressure cooker, she would can green beans and other non-acidic produce. And the pickles….she pickled a lot. What I remember most about those days was the heat. Most of the vegetables and fruits would ripen during the hottest months, July and August. I remember many a day sweating alongside mom in the garage kitchen. Mom had furnished this canning area in our garage (which was really more like a barn) with appliances bought cheap at farm auctions. She had a double-cast iron farmers sink, a gas stove, and a dilapidated but still working refrigerator. Her rationale was that we did not have to heat up the house. In reality, it was a sweat shop out there and I would have much rather been inside with the air conditioner. Now as I survey my wreck of a kitchen after canning, I realize her wisdom. Clean up was simpler and I remember times when we actually washed out our work area with a garden hose. Enjoy this concoction on the obligatory biscuit, English muffin, or homemade bread (see above) in the mornings, but also enjoy it on top of ice cream. One of my favorite ways to enjoy this jam is to eat it with a hot dog. What? Yes, you heard me right. Spread a toasted hot dog bun with cream cheese, spoon on some of this jam, place on a grilled-to-perfection hot dog, and top with jalapeno relish. This supreme idea is not mine. 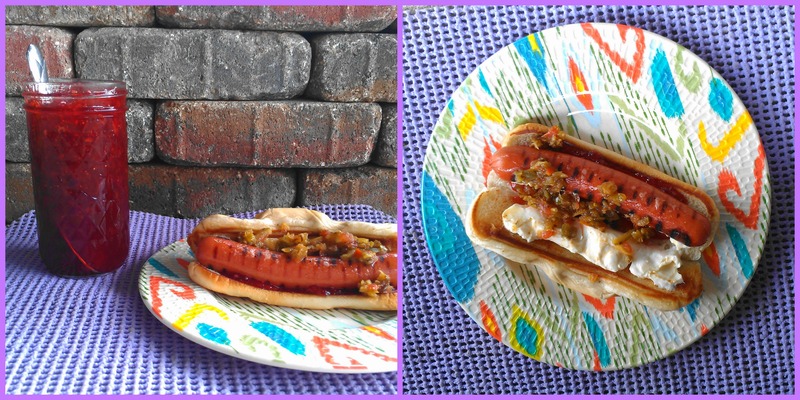 It is from The Dog House Food Truck’s Mercury Dog, only raspberry jam is used on the original. Don’t be scared…try it. It’s a beautiful thing. Besides this beautiful hot dog creation, feel free to use Balsamic-Basil Strawberry Jam as a glaze for grilled chicken, lamb, or pork as well. If you are still reading, thank you. I applaud your efforts in making it through this rambling post. To win some of your own Gourmet Garden products, enter THE GIVEAWAY. Please follow Gourmet Garden on Twitter and Instagram. 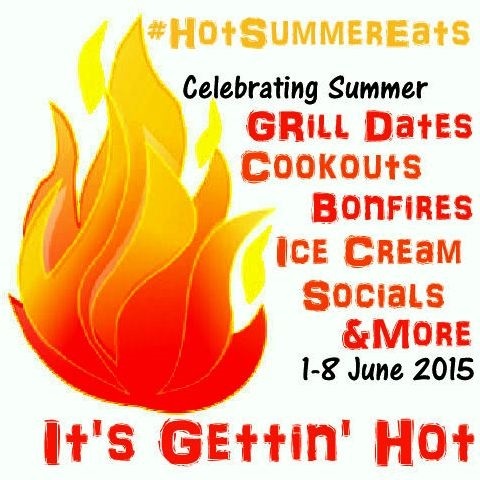 Disclaimer – Thank you to #HotSummerEats sponsors BenBella Vegan, Caribeque, Casabella, Gourmet Garden, Intensity Academy, Not Ketchup, Out of the Weeds, Pirate Jonny’s, Quirk Books, Spicely Organics, T.Lish , and Voodoo Cheff or providing the prizes free of charge. These companies also provided the bloggers with samples and product to use for#HotSummerEats without additional compensation.All opinions are my own. Back in the day a lot of people had 2nd kitchens just for canning. Makes a lot of sense (and I like the idea of garden hose cleanup!). Anyway, this is terrific jam — love the balsamic vinegar. Thanks. This looks amazing! Strawberry season is just winding down here and I haven’t put up as much strawberry jam as I would have liked. Will have to add this to the list. The Gourmet Garden herbs are the best! Strawberry season is just starting here in Michigan and I love the idea of jalapeno/strawberry on the hot dogs. YUM…and rambling on is what we do sometimes….that’s why we blog. 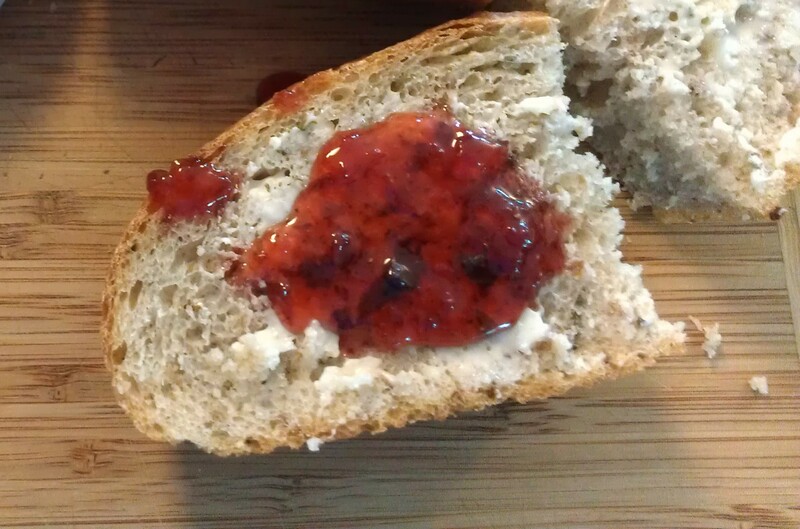 Oh yay – another great jam recipe!!! I’ve made strawberry jam with balsamic but have never added basil. Sounds delightful! Yum! I never thought to use the dried herbs in canning! Can’t wait to can some salsa! I have never try a hot dog with jam. How fascinating and it sure looks very tasty. Love, love… did I say LOVE? The balsamic in this recipe!! Totally brilliant! i love the combination of balsamic andies. strawberries. I want to wash my kitchen down with a garden hose most of the time but especially after canning!